The football manager Neil Lennon really should do himself a favor and walk away from Glasgow Celtic as soon as the Scottish League title is under lock and key at Parkhead on Sunday night. The former Northern Ireland and Celtic captain, a very young man only just turned 40, could clearly do without the aggravation that goes hand in hand with life in the Old Firm bubble. Sunday was a classic case in point as Celtic’s title winning appointment at Ibrox turned into a damp and ugly squib. All Lennon’s team needed to do was go and win against a Rangers team caught in the middle of an horrendous financial meltdown, and the championship was theirs. Instead they lost 3-2, had two players and their manager sent off and allowed their fiercest rivals to wallow in achievements on the field when events off it are breaking their hearts as well as their bank balance. To make matters worse, Lennon was advised – for his own safety – to watch the second half of the game from the safety of the media room under the main stand at Ibrox. It later transpired that the advice came from his own club’s security people, advice which tells you all you need to need about the volatile nature of Old Firm derby games. Both Celtic and Rangers had to issue statements on Monday to clarify exactly why Lennon didn’t get to watch the final 45 minutes of another frantic match from the director’s box at Ibrox, after he had been sent off by referee Calum Murray for a halftime verbal exchange in the tunnel. Lennon swore afterwards that he didn’t swear at the referee – if you know what I mean – and also had a bit of a meltdown, in the press conference room, about having to watch the rest of the game from the very same media room. 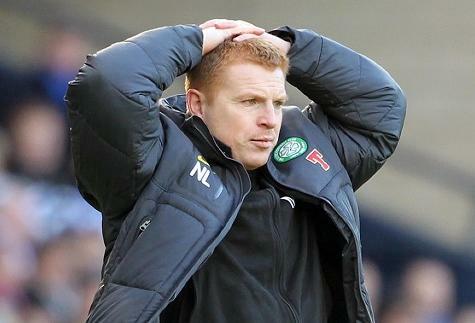 “I can’t sit in the stand for my own safety, that sums things up in this country,” said an angry Lennon after the game. As it happens, it was the Celtic security people present, not Rangers officials, who told Lennon not to sit among the directors from both clubs. They really did fear he could be attacked by fans sitting in the seats near the directors’ box as tempers became as flared as normal in the red hot atmosphere of an Old Firm encounter. Lennon had good reason to be angry during and after the game, but that won’t help him when he answers Scottish FA charges of improper behavior next week. Nor will it disguise the fact, despite Sunday’s defeat, that Celtic are wasting their time playing in a Scottish League going nowhere fast. The current financial problems at Rangers mean they won’t have the money or the stomach for a real battle with their Celtic rivals on the pitch for some years to come. Unless the Gers can attract serious financial investment -- unlikely since their current plight is the result of a really bad investment -- then the two-horse race that is Scottish football will become a one horse race for the foreseeable future. That cannot be an attractive proposition for Lennon, a young manager who wants to go places in the game and won’t get there with Celtic in their current guise. Watching Scottish football on a television screen – as he did for the second half of Sunday’s match at Rangers – may well be the way forward for Neil Lennon. The sooner he realizes that the better – for his own sanity if for no other reason.